Tax season is here again, so naturally, it’s a time to start thinking about how and when you’re going to file your taxes. When it comes to filing taxes, some things are optional like whether you file on your own or get the help of a tax preparer. Plus, another decision may be whether you file right away or wait until the last minute. Regardless of the method and time frame you choose, you do know one thing: you’d like to get as large a refund as you possibly can (or at least pay as little as possible). And that’s why you’re wondering if you can get a tax deduction for your countertops. 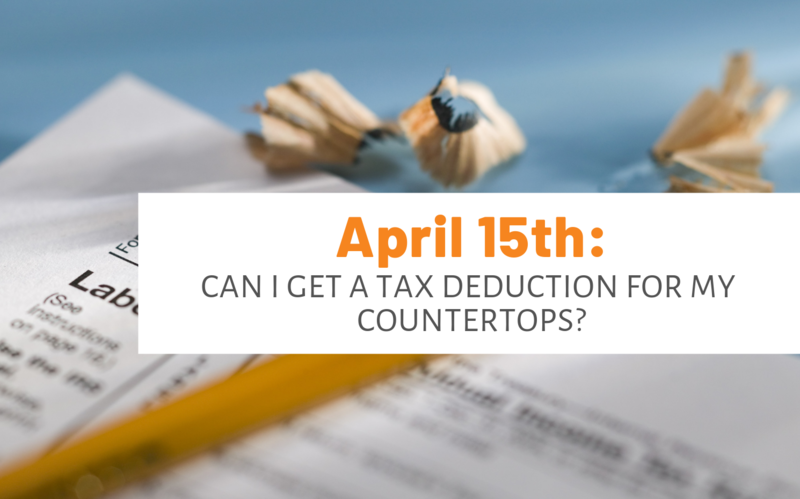 Whether you can get a tax deduction for your countertops is a fair question. Because, after all, who doesn’t like maximizing their own financial position by any legitimate means. Faced with the possibility of paying a larger sum of money or a smaller sum of money, who wouldn’t choose to pay the smaller sum? Let’s imagine a couple of scenarios here. Let’s pretend Jack and Amanda Jones live with their three kids in a two-story colonial. Here’s a family that’s finally taken the plunge and is doing a home makeover. Not the whole home right now, though. In fact, it’s just the kitchen and bathrooms they’re remodeling — including, of course, beautiful new stone countertops. They’ve dreamed of this for a while, and it’s finally getting upgraded from a dream to a reality. Could this help them out on their taxes? Well, it may have a positive effect in the future. However, we’re not talking about it affecting their taxes this year. Actually, we’re saying they could see good come of it later on, namely when they sell the house. To learn more about this possibility, check out When Home Sellers Can Reduce Capital Gains Tax Using Expenses of Sale. John Daley is on his second career. He saved a nice “nest egg” with his first job. Then, when he retired, it was on to his second job! He keeps an eye out for good homes for sale within a 300-mile radius. When the price is right, he buys them and turns them into rental properties — an ongoing source of income. In his free time, he travels the world with his wife and, on some occasions, a grandchild. Sometimes, he finds himself looking to remodel one of his rentals. His thinking is that a nicer house could bring in more rent. In this landlord’s case, he may want to check with his accountant about the money he invests in remodeling. There may be positive tax implications for some of what he has laid out on his rentals. However, what he may be looking at here is depreciation over the course of years as opposed to a lump sum deduction in the year he incurred the expense. Three generations of the Howell family own a travel agency together. They help people all over the state plan thrilling trips. They have an office building in a downtown area, and they’re finally getting around to rehabbing it. Consequently, it should be a more pleasant place to mastermind vacations with their clients. Now, instead of an old cork countertop in their reception area, they’ll have a gorgeous stone slab. They’ll want to review their work here with their tax advisor. That’s because they may be able to count their changes as business expenses. And that, in turn, could reduce taxable income. Jess & her husband are planning to remodel certain areas of their home after Jess’s mother moved in with them. She uses a wheelchair, so they’d like to make the home wheelchair accessible. That’s why, both the kitchen and the downstairs bathroom will soon get their layouts changed. Also, the couple is planning to lower the countertops in both locations. In short, they’re installing the new counter as part of a kitchen renovation to make the kitchen accessible to someone with a disability. Thus, they may want to check whether that could have a positive effect when it comes to taxes. They could learn more about medically necessary home modifications and discuss the possibility with a professional. Note that while you may find positive tax implications for renovations, repairs may not have the same effect. Improvements and repairs are not the same things. We’re happy to be able to say that stone is our expertise. So, when it comes to your countertops, you can count on us to set you up with a slab of stone fit for just your needs. At the same time, keep in mind that we’re not tax experts. So when it comes to getting definite answers to questions about tax deductions for your countertops, you may want to explore further. Get in touch with a certified public accountant or another tax professional in your area to discover what tax deductions you may be eligible for. If you find that you’re not in the same shoes as any of the people in our above examples, that okay. But what if you’d like to be? Maybe you’re thinking about tax implications now because you want to make some changes to your kitchen, bathroom, or even office counters in the future. In that case, check out our Questions To Ask Before Hiring A Countertop Specialist. Or if it’s for your vacation home, take a look at The Best Countertop Choices For Your Cabin Up North.